Andy is still running 4th | Stand, spray and deliver. ENJOY ELD’S REPORTS FROM HIS 2 WEEK MEMBERSHIP TO THE TENNIS COGNOSCENTI AS THE AUSTRALIAN OPEN REACHES IT’S SMASHING CLIMAX! Warning: this is an uneducated rant from a once-yearly tennis expert who is seduced by the business end of his home major. There’s no doubt about it. 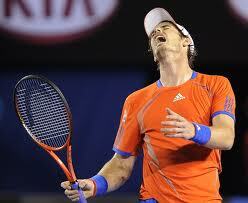 Andy Murray is very good at playing tennis. His off-court parlance would seem to indicate he is sending himself to sleep, but nonetheless, he is a ripping talent on the court. Another participants ribbon for Andy. We witnessed another big gleaming trophy and novelty-sized cheque fall by the wayside for Britain’s number 1 hope last night at Melbourne. He ran wretchedly close to trampling Novak, but in the end he couldn’t take advantage of the Serb’s mid-game lethargy and loaded snout of phlegm and eventually perished in 5. Every Grand Slam I ponder; is this the year that I will no longer be able to laugh at the expense of British tennis and their 76 years of famine at Open level? But every time, he accelerates to the pointy end before coming up short against class. Watching Tim Henman conk out in major semi-finals was cruel, but as an Australian, watching Murray build up the expectations of his motherland and repeatedly drop them on their arse is schadenfreude in it’s purest form. Success by his standards at the majors remain as sparse as his unkempt facial hair. Outside of the 4 big tournaments, when people like me aren’t paying much attention, Murray produces results that places him high in the rarified air of tennis royalty. 3 Slam finals and 4 semi finals, 22 career titles and a shitload of deed fees indicate that he traded some personality for talent. He can definitely engage the string instrument much better than 99.98% of blokes on this planet. Another Open, another wasted singlet. But shouldn’t he have to conquer at least 1 of the coveted Open titles before he can be spoken of in the same breath as the other 3 in the group? Monarch status and imagined groupings based on a class system should currently only include tennis superhumans Roger, Rafa and The Djoker. Andy is subordinate to these 3 beasts of the game. Until he rolls one of these guys on his way to the champers in something significant, he will remain detached from business class, isolated in his own group as the 4th best player in the world. While I’m on a roll with tennis, I’ve got to give a shout-out which may ruffle some feathers. What kind of shithead suppresants did Channel Seven feed Lleyton Hewitt before they let him in front of their microphones? His commentary has had me reaching for the TV guide to confirm who I am listening to. He is bringing some super insights to the telecast and delivering them with a dignified and respectable approach, one which seems to abandon him when he has a racquet in his hand. Good on ya Lleyton; you may win some fans in the skeptical Australian public yet. Getting old and having kids, or the temptation of a fat contract from Seven, has transformed you into an articulate spokesman for the game in Australia. I look forward to listening to you and that ginger ninja from America dissect the final on Sunday night. I’m hearing a lot of bellyaching from the tennis public about the prospect of tonight’s final between Sharapova and Azarenka being nothing more than a squawking foghorn-fest of the highest order. But I can tell you one thing; none of the whining seems to be coming from the dudes. E dog, Murray is just unfortunate to playing in same era as possibly the best 3 ever. If he was 10 years earlier he would have swept all before him. I think Murray’s silverware will come when one of the top 3 pull up lame mid tournament. However, I do chuckle that a nation with Great Britian’s size can’t put anyone else up with any cred and has been unable to win a major in 76 big ones; the diffinition of hopeless. Yep, I feel for the poor fella, he’s doin the rounds at the wrong time. You’re right, he needs some well-timed injuries to his opponents before he sees any glory! I wonder if he’s considered rat-sack in the hotel buffet? Eldo Who cares he is a Scot so that makes him a pom by default!